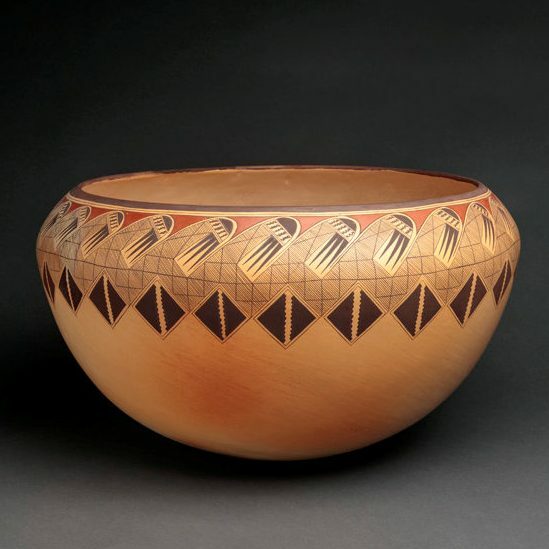 This is an amazing large open bowl by Jacob Koopee. 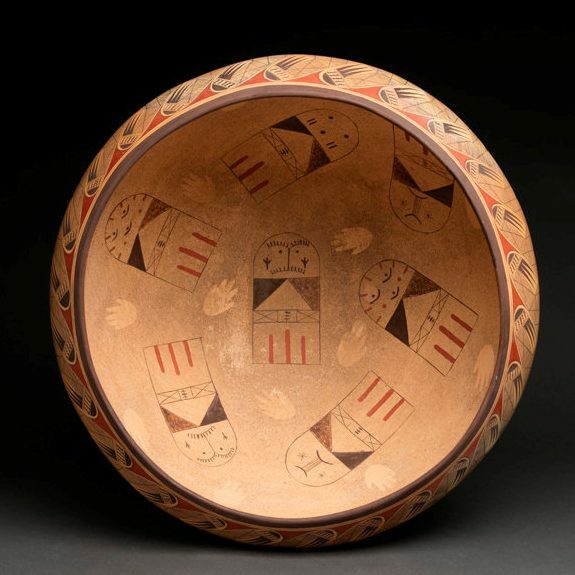 Jake was known for his large pieces and his variations on traditional Hopi-Tewa designs. This large open bowl is coil built and it is painted on the outside and the inside. On the outside there is the classic migration pattern. Jake had an ability to paint the fine lines of the pattern thin and even. 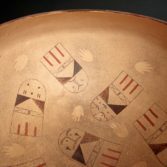 The inside of the bowl is also fully painted with hand prints and cradle dolls. Each of the cradle dolls is a different katsina, including a Qooqule, Grandmother, Runner and other figures. 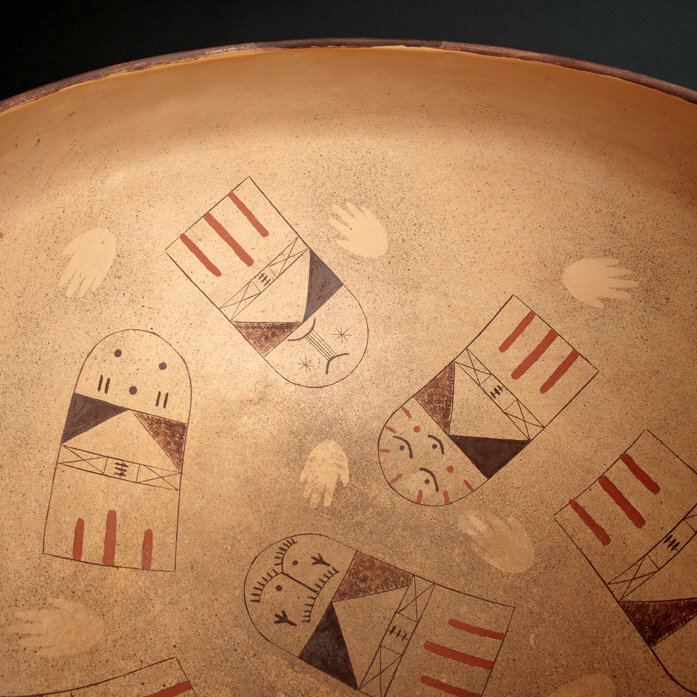 The small hand prints were meant to represent the children given the cradle dolls as gifts. The bowl is signed on the bottom with a flute player, which was one of Jake’s signatures. 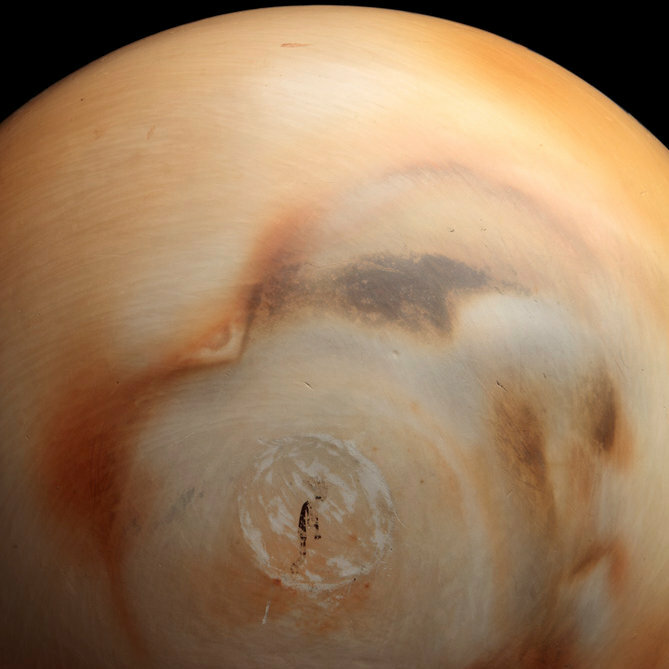 This immense bowl is a striking example of his skill as both potter and painter. It is traditionally fired and painted with bee weed (black) and natural clay slips. Jake won numerous awards during his career including “Best of Show” in 2005 at both Santa Fe Indian Market and the Heard Museum Market. I was lucky to have been a pottery judge both years at both events, and it was exciting to see an artist create such dynamic work. Our consignor has asked us to lower the price, which makes this large bowl an exceptional value.